When it comes to God, Vermont’s just not that into Him. Or Her. 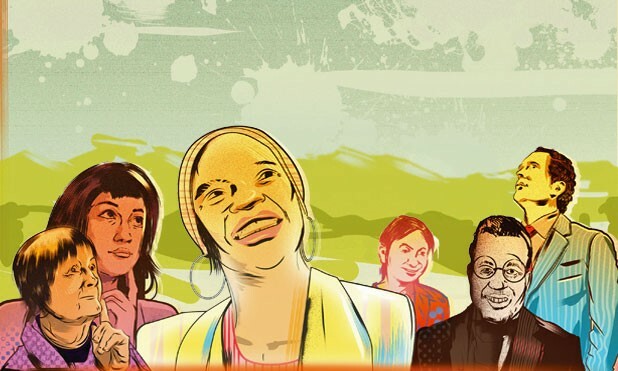 Our ranking as America’s least religious state was reaffirmed by a Gallup poll in February that indicated only 23 percent of Vermonters consider religion an important part of their daily lives and attend religious services every, or almost every, week. Among the 50 states, only New Hampshire is as godless. This year’s town meeting in Franklin was the second without an opening prayer, the result of a lawsuit by resident Marilyn Hackett and the American Civil Liberties Union, who objected to voting on the town budget in the name of the Father, Son and Holy Ghost. In light of that case, the Vermont League of Cities and Towns this year urged other town meetings to drop opening prayers. And yet, there are signs of religion everywhere in Vermont, starting with the ubiquitous and iconic white church steeples across the state’s landscape. And while town meetings might steer clear of God, House and Senate sessions in Montpelier routinely open with invocations by religious leaders. Vermont is also the birthplace of Mormon prophet Joseph Smith (Sharon, in 1805), the home of St. Anne’s Shrine in Isle LaMotte, the former home of the Twelve Tribes sect in Island Pond, and has a thriving — and rapidly expanding — Christian radio chain called The Light. Many Vermonters have gone to the mat to protect their right to worship how they please. Remember Shawn Byrne, the West Rutland man who sued the Vermont Department of Motor Vehicles after it said he couldn’t have vanity plates that read, “THE REV” and “PSALM48”? He fought that case to federal appeals court and won. For this week’s cover story, Seven Days sent its staff to places of worship large and small, public and private, to meet the faithful and discover the religious pulse of Vermont. Our survey is not intended to be, uh, gospel, but rather a sampling of various ways Vermonters commune with the Great Mystery. Oh, and we figured Catholics got more than their fair share of attention over the past few weeks — lookin’ at you, Pope Francis — so none of us chose to go to mass. Instead, we meditated with Buddhists, prayed with Muslims, waved palms with evangelicals, sang with Mennonites and admired some power animals. 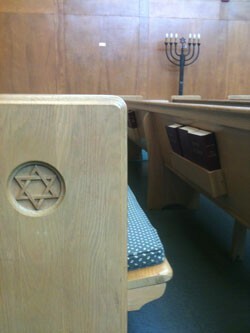 We ate snacks with Greek Orthodox, celebrated Shabbat with Jews and pondered worldly writings with UUs. Maybe most of us avoid joining a “team,” but spirit is clearly moving in Vermont. With sacraments called “mysteries,” incense meant to represent sweet prayers rising to God and nearly half a year spent fasting in some form, it’s no wonder the Eastern Orthodox Church can seem exotic even to other Christians. But visitors might be disappointed by the utter lack of mystery during a service at the Dormition of the Mother of God Greek Orthodox Church on South Willard Street in Burlington. In many ways, the church of about 90 parishioners resembles an exceptionally casual, friendly Roman Catholic Church. Families with small children wandered in 15 and even 45 minutes late to the 10 a.m. Sunday service. Father Robert Athas addressed kids directly with a quiz about his vestments and a brief talk about the rituals of bringing Holy Communion to the sick. The first difference a visitor might notice is that Athas does nearly every part of the service twice. The choir, too, sings most of its material in English, then in Greek. Much of the original liturgy, said Athas, dates to about 350 AD, a time when Christians were still persecuted and hiding their rituals. Other music is more recent, with additions to the mostly sung-through ceremony still being written today. Many of the parishioners were quiet, abiding by Athas’ frequent address of “let us be attentive.” A few, mostly older voices rose from the back of the church, creakily answering the priest’s call-and-response in both languages. Many of them have been part of the flock from the beginning. Burlington radiologist John Tampas was the church’s first president and was elected to the position again in 2011. In the late 1950s, sermons at 107 Pine Street by a visiting Montréal-based priest inspired the beginnings of a Greek Orthodox congregation. 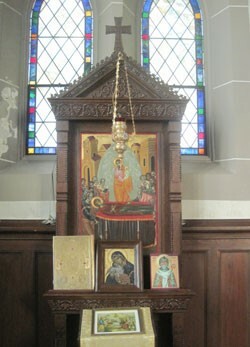 Before long, the community moved into its current location — a former Episcopal church — painted icons with a heavenly gold background over the altar, and began to welcome members who traced their origins beyond Greece. 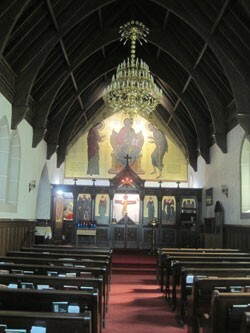 Today, parish members refer to themselves as “pan-Orthodox.” Several older Russian men took up a table together when members gathered after the service for snacks. Other members hail from Bulgaria, Moldova and Bosnia. What unites them is a belief in living life according to the Holy Spirit. “It’s a very good, centered way of living,” said Athas. Guidance is sought through prayer. Traditionally, the religion’s monasticism involved long stretches of silence and frequent abstention from various foods and other worldly pleasures. But in a family parish such as the Dormition church, the focus is not only on maintaining a relationship with the Holy Spirit but also fellow humans. Greek food festivals several times a year allow community outreach in a delicious way. A famous face from the community, Nectar Rorris, founder of Nectar’s, is one of the members serving up fare including souvlaki, gyros and Greek pastries. As Athas put it, “We provide food for the soul.” But for this parish, which hosts its next festival this Saturday, an earthly taste or two doesn’t seem to hurt. Holly Thompson apologized for having only a lawn chair to offer her visitor; she had just moved into her Essex apartment and wasn’t settled in yet. But Thompson had erected her five altars, which she uses daily in her pagan worship. Though reliable numbers are unavailable, Vermont is believed to be home to scores of pagan practitioners, groups and covens. Nationally, 682,000 people called themselves pagans in the 2008 ARDA survey. Paganism refers to a diversity of pre-Christian, polytheistic folk traditions and indigenous customs. Some groups, such as the Green Mountain Druid Order, based in Worcester, have been around for years. Others, like Thompson’s small worship group in Randolph, are newer incarnations with more fluid memberships. Thompson, 27, practices “eclectic paganism,” a personalized blend of beliefs and practices she draws from Wicca, shamanism and ancient Egyptian tradition. 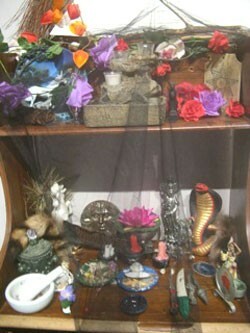 In her bedroom stands her “working altar.” On it sits a raccoon tail — representing one of Thompson’s “power animals” — a bird feather, pentagram and Egyptian divination tool. A stuffed crow stands watch on a windowsill. Thompson has also decorated her body with animistic imagery. She sports tattoos of a raccoon, bat, wolf and a scarab. Growing up in Morrisville, Thompson was raised nominally Christian. Then, a high school friend introduced her to Wicca. Thompson said she was attracted to paganism’s Earth-based philosophy, which emphasizes nature’s diametric forces: light/dark, good/evil, yin/yang. She believes in reincarnation and “shamanistic journeying,” or traveling to other dimensions via trance. 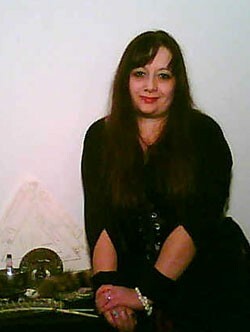 Thompson mainly worships privately, through prayers and spells. Many of these she dedicates to Macha (pronounced “Maxa”), a Celtic warrior goddess. Other times, Thompson worships with her Randolph group, which meets to celebrate the equinoxes and Sabbats — eight pagan festivals that commemorate seasonal changes. Several weeks ago, they gathered for Imbolc Sabbat (or Candlemas), a Celtic light festival that heralds the approach of spring. As pagans consider nature their “church,” many, like Thompson, worship outdoors. 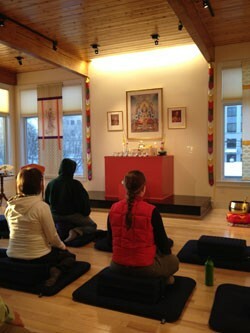 Typically, her group begins by “opening the circle,” or cleansing the area of negative energy to create a sacred space. Then, they’ll call upon the elements and summon various gods or goddesses with whom they wish to commune. They may honor their spirit animals by dressing like them and dancing, or drum and chant to induce a trance. Later, they’ll light candles, offer thanks and close the circle. Thompson said that most Vermonters, including her own family, accept her beliefs. Since moving to Essex, she’s sought out like-minded believers who want to “figure themselves out spiritually. 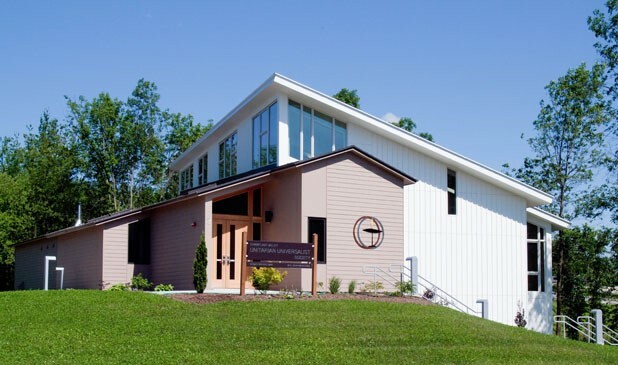 Fewer Americans are going to church every Sunday — but apparently the congregation at the Champlain Valley Unitarian Universalist Society didn’t get the memo. Their new church in Middlebury was comfortably full on a recent Sunday morning, packed with young families, gray-haired congregants, and a choir and string band. Sure enough, at that morning’s service, the congregation looked on as seven worshipers officially signed up as church members, joining a community of roughly 175 adults. 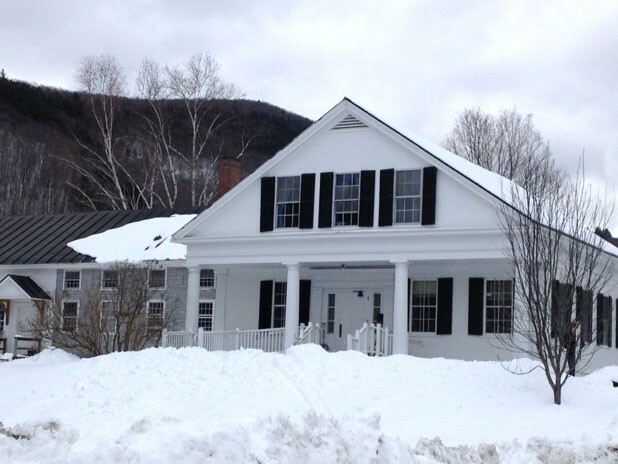 “I don’t think membership has ever been higher than this,” said Feder, a former New York Times reporter who came on board as Middlebury’s minister last August, after the service. UU services vary by congregation. Worship in Middlebury on a recent Sunday kicked off with a reading from Walt Whitman and the lighting of the “flaming chalice,” the most widely used symbol of Unitarian Universalism. The congregation launched into a song adapted from a Ralph Waldo Emerson poem, and later heard brief readings from the Hindu text the Bhagavad Gita and C.S. Lewis’ Mere Christianity. In fact, there were precious few mentions of God throughout the service. “God talk” was a touchy subject for decades among some UU congregations. Twenty years ago, Feder said, the majority of people flocking to UU churches were those who’d been “wounded” in some way by their experience with traditional religion. Today, roughly half of congregants come from other faith backgrounds, but just as many come without any religious upbringing at all. Lest you think this a religious free-for-all, Feder cautioned that just because the UU faith attracts members who believe “no one has a monopoly on the truth,” that’s not a free pass for ignoring difficult questions of faith. You probably won’t find a more racially diverse gathering in Vermont than at the weekly Islamic congregational prayer service in Colchester. More than 100 men — many with brown or black skin and a few with white — kneeled and stood shoulder to shoulder in a room roughly one-third the size of Burlington City Hall’s Contois Auditorium. An unknown number of women assembled separately at the same time — 1 p.m. on Friday — in an upstairs space that cannot be seen from below. The location is the Islamic Society of Vermont’s mosque in one of the many century-old brick buildings in Fort Ethan Allen. It’s the only holy place of its kind in a state that’s home to a growing population of Muslims, currently estimated at about 4000. 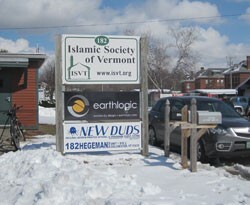 Many have come to Vermont as refugees from Sudan, Somalia, Iraq and Bosnia, explained Islam Hassan, the imam, or religious leader, of the state’s Islamic Society. Though born and raised in Egypt, the bushy-bearded Hassan has lived in the United States long enough to have acquired an American accent. He’s served as the local imam for the past two years, and prior to that held the same post at a mosque in Minnesota. His wife still lives there, “so it’s a bit hard for me to be in Vermont,” he said after leading last week’s 45-minute Jumu’ah (Friday prayer session). The faithful are mandated to attend the prayer service on the Islamic holy day in the same way that Catholics are required to attend Mass on Sunday. Muslims are actually obligated to pray five times a day, every day, in keeping with one of their religion’s “five pillars.” These basic acts of Islam also include a proclamation of faith; almsgiving; daytime fasting during the lunar month of Ramadan; and the hajj, or pilgrimage to Mecca in Saudi Arabia, that is supposed to be undertaken at least once during a Muslim’s lifetime. As 1 p.m. approached last Friday, a steady stream of men of various ages made their way into the mosque after removing their shoes in a mudroom. Most sat cross-legged in silence on the thick rug that covers the prayer space. Some whispered greetings of “As-salamu alaykam” (“Peace be with you”) as they shook hands with friends. A few young boys rolled around on the floor or wiggled on their fathers’ laps. The service began promptly with a man chanting melodiously in Arabic through a microphone as he leaned into a semicircular niche carved into a wall facing east — toward Mecca. Hassan then rose to lead prayers and deliver a sermon, with sections spoken first in Arabic and then in English. 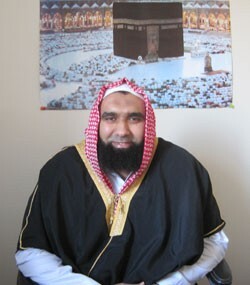 “If I said the whole thing in Arabic, hardly anyone could understand me,” he said afterward, seated in an office decorated with posters of the Kaaba, the cuboid building in Mecca that ranks as one of Islam’s most sacred sites. In his sermon, Hassan emphasized the importance of mercy in Islam, which extends, he said, “even to the animals.” He told a story contrasting the behavior of “an Israeli prostitute,” who saved a dying dog by giving it water, with that of a “devout [Muslim] woman” who allowed her pet cat to starve to death. God was so pleased with the (presumably Jewish) woman who had acted mercifully that she was forgiven her sins while the cruel Muslim woman was duly punished, Hassan told the gathering. Shabbat is Hebrew for Sabbath, and, like Christians, Jews embrace it as part of God’s seven-day Creation. But for Jews, the “day of rest” is Saturday — not Sunday — and the “left-leaning Conservative” ones at Burlington’s Ohavi Zedek interpret that as a divine directive. Jewish law specifies 39 activities that are prohibited on the work-free Sabbath. Along with “gathering” and “igniting a fire” are writing and erasing. Damn. “I guess you’ll just have to remember the whole thing,” Hershberg suggested cheerfully. Donning a colorful prayer shawl to match her yarmulke, she led me into the brightly lit synagogue affectionately known as O.Z. To the uninitiated, the room itself doesn’t look all that different from a church. It’s got pews and prayer books, stained glass and an organ. But the synagogue’s wooden walls are unadorned, and natural light streams in from the etched clerestory windows all around the room. 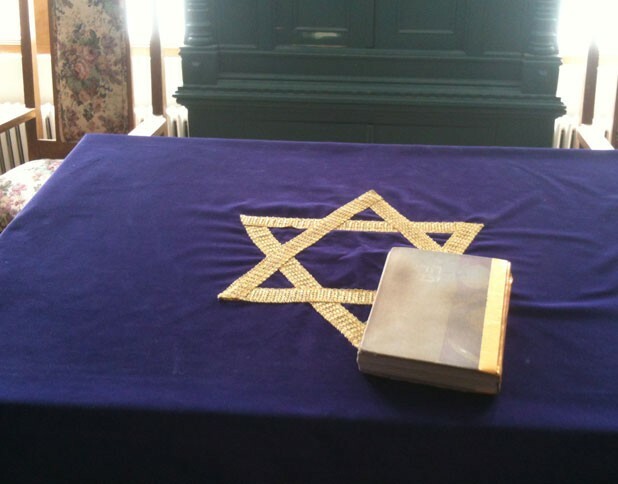 On the Jewish equivalent of the altar is the Holy Ark, a carved cabinet that contains at least one parchment scroll of the Five Books of Moses. 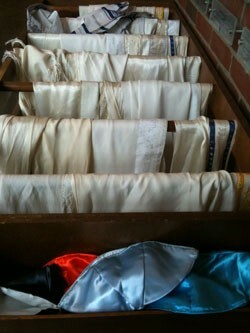 The Torah is at the center of every Shabbat synagogue service. Hershberg, an O.Z. trustee, confessed she almost never gets there at nine o’clock, when the preliminary prayers start. Fewer than a dozen, mostly older congregants were gathered when Rabbi Joshua Chasan started calling out page numbers of the prayer book, which reads from back to front. I read the English translations of the Hebrew as Assistant Rabbi Jan Salzman sang the latter as cantor, a job that Orthodox Jews only bestow upon men. In her strong alto, Salzman performed the a cappella chants with remarkable rhythmic variation and haunting “tropes”— sometimes solo, sometimes with the congregation. More people trickled in the open door for the Shema, the central affirmation of the Jewish faith, and the Amidah — all about God and Moses and the Israelites. Good thing, because the Torah rituals require congregant participation, from extricating the three-foot scroll from its velvet sheath and parading it around the room to actually deciphering its ancient lettering. Every week, synagogues all over the world read one prescribed selection from the Torah. On this Saturday before Passover, the story from Leviticus 8 involved Moses, Aaron, his sons, a bull and two rams — and did not end well for the animals. What came after, though, was uniquely Burlington: a guest sermon by Rev. 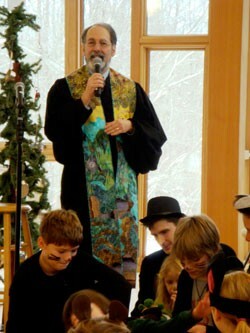 Peter Cook from the First Congregational Church — part of a local interfaith pulpit exchange. The minister, who had trouble keeping his yarmulke on, built his remarks around a Deuteronomy passage that appears at the Holocaust Museum in Washington, D.C. Cook praised Chasan for speaking out against discrimination and intolerance in Vermont. O.Z.’s outspoken rabbi is retiring in 2016. As the service drew to a close, things got more practical: Chasan read a sick list — to which congregants called out additional names — and the upcoming week’s yahrzeits, or death anniversaries. He also suggested that anyone without a seder dinner invite, or with an extra place at a Passover table, should call the office early Monday — presumably so a little matchmaking could be done. Hershberg said she likes the Shabbat service because it makes her feel connected to Jews all over the world. As an outsider, I was struck by how it holds a local community together. “The media is in love with Pope Francis,” said pastor Gwen Groff from behind a small pulpit — it’s really more like a music stand — addressing the small group seated before her. 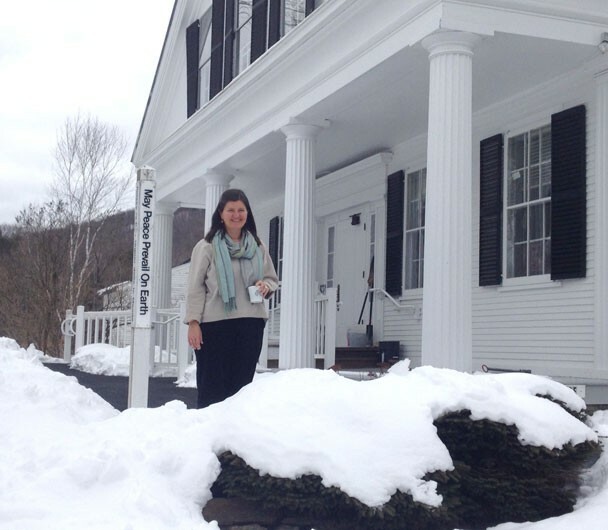 For 13 years, Groff has served as the minister at the Bethany Mennonite Church, a parish of about 40 members nestled in the riverside town of Bridgewater Corners, Vt., near Killington. Musing on the new Catholic leader, while timely, initially seemed an odd choice to begin a Palm Sunday sermon. Mennonites are Protestants and occupy a branch of Christianity deliberately far removed from Catholicism. But Groff is enamored with Francis’ now-famous reticence about papal luxuries — riding the bus instead of taking the Popemobile, for example — and sees a lesson for her congregation. “We admire those with great power who set it aside,” she said. It was an apt lesson for Palm Sunday, a day that celebrates Jesus’ “triumphal” entry into Jerusalem days before the Last Supper. According to the Gospel, the King of Kings arrived in the city atop a lowly donkey, greeted by believers who laid palm leaves in his path. 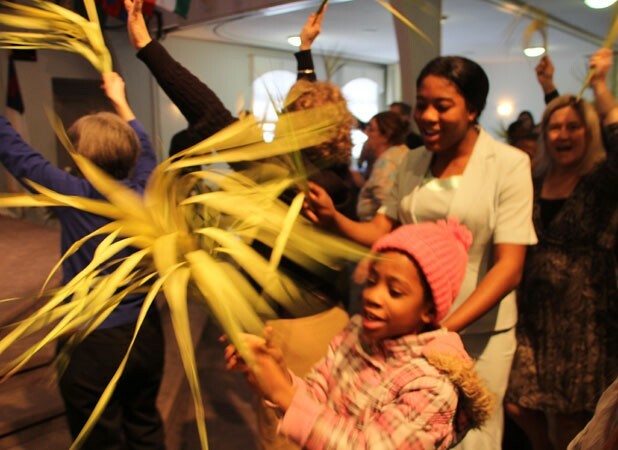 While Easter Sunday, which celebrates Christ’s resurrection, is the holiest day on the Christian calendar, Palm Sunday is perhaps more illustrative of Mennonite faith, which places paramount importance on humility. The Bethany Mennonite Church, built in the 1950s by a small group of believers from Pennsylvania, is spare; a handmade photo collage is one of few adornments on its wood-paneled walls. Instead of large gold crosses, you have to look hard to find a crucifix here — it’s beside a candle on a table near the apse, but it’s small, wooden and obscured by a large vase of wildflowers. There is a portrait of Jesus, but even he occupies an inconspicuous place, hanging alone on a far wall. “Some people think even that’s too much,” Groff later said of the familiar blue-eyed likeness of JC. Mennonites are sometimes confused with the Amish. Both faiths are Anabaptist, practicing adult, rather than infant, baptism. And both believe in absolute pacifism. Certain “old order” Mennonite communities, such as the one in Wolcott, Vt., do adhere to conservative practices and lifestyles similar to those of the Amish — plain dress, a degree of isolation, etc. But the majority of modern Mennonite congregations, including the Bethany church, which is part of the national Mennonite Church USA organization, exist in harmony within their larger communities. The small parking lot outside the Bethany church was filled with Subarus and pickup trucks. Inside, the congregation was clad in jeans, sweaters and flannel shirts, reflecting the casual atmosphere of the service. There was only one short reading from the Gospel. Groff’s sermon clocked in at under 10 minutes. There was no Lord’s Prayer. But there was music, and lots of it. At least half of the hour-long service consisted of congregational hymns, sung in four-part harmony with no accompaniment. 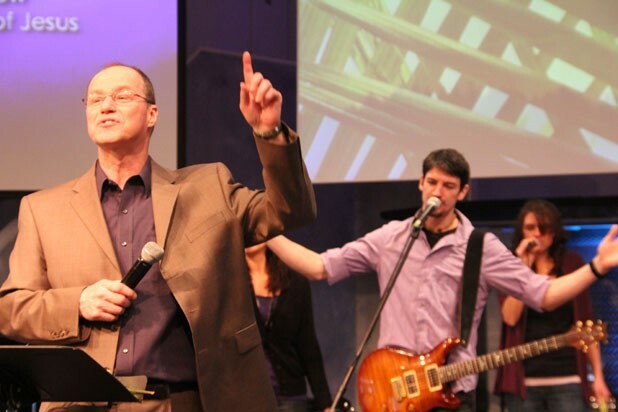 Groff said that while the informal tone of services at Bethany are not necessarily typical of Mennonites elsewhere, the reliance on music most certainly is. “We like to let music bear the message,” she said. That same evening, a chattier assembly packed another room, prepared to learn about A Year to Live. No, it wasn’t a support group for the terminally ill. The subtitle of the program held a clue: “Meeting Life, Meeting Death.” In it, participants commit to a year of meditation, readings, journaling and discussions about impermanence; by facing your death, the theory goes, you learn to appreciate life. Though the total number of Buddhists in Vermont is hard to calculate, an online director says there are 26 Buddhist centers, for varying sects, around the state. Director Richard Does, 73, has been there from the center’s beginning in the late 1970s. A clinical psychologist, Does noted that there are three lineages of Tibetan Buddhism, each with “a little different spin on how to achieve wisdom.” Shambhala, the oldest, “is like the context of the others,” he added. Accordingly, Burlington’s Tibetan community is welcome at Shambhala Meditation Center, which is where this reporter met Sonam Chophel. An immigrant to Vermont in 1999, he was deputy secretary of religion and culture under His Holiness the Dalai Lama in Dharamsala, the Tibetan exile community in India. For Tibetans, of course, Buddhist practice has a political overlay: the Chinese occupation of their homeland. On Sunday, a large photo of the Dalai Lama hung over a makeshift altar in the Fletcher Free Library’s Community Room, where Chophel had invited Seven Days to attend the bimonthly prayer meeting. A droning chant from the mostly older men and women filled the room as he earnestly explained their focus. “What we want is the world as a whole to tell the Chinese that everyone should have religious freedom,” Chophel said. Outside the room, his toddler granddaughter and two other tots cavorted, yet unaware of their roles — as Vermonters — in Tibet’s long history. Was this church, or a rock concert? It was 10 a.m. on Sunday morning when the Worship Team — a nine-member band with electric guitars, keyboards, a drummer and four singers — took the stage. Above them, lyrics flashed karaoke-style on two big screens, and a video of a smiling Jesus weaving through throngs of palm-waving worshipers looped on another. 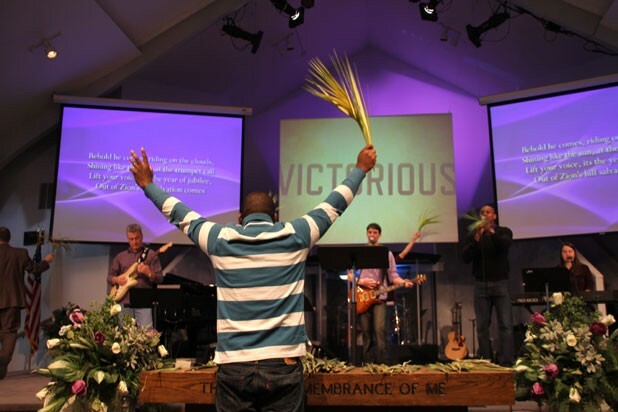 It was Palm Sunday, Jesus’ rock-star day. The Christian holiday marks the day — a week before his resurrection — that Jesus rode a donkey through Jerusalem and was treated like a king. Worshippers threw their clothes on the ground before him and waved palms as he passed. Last Sunday, in the CBC’s airy, modern digs, more than 300 people sang, danced, shook palm branches and, at one point, formed a full-on conga line in worship. The joy in the room was impossible to ignore. Community Bible Church is an Assembly of God denomination. Pastor Mike Kriesel later described the group, which broke off from the Methodist Church in 1916, as the far arm of the evangelical movement. “We believe in the moving of the Holy Spirit today,” he explained. In the 1970s, during the Jesus Charismatic Movement, Assembly of God was the fastest-growing Christian denomination in the U.S. These days, Kriesel says, there are roughly 12,000 such churches in the U.S., and it’s even more popular worldwide. “We actually have the largest church in the world, in South Korea,” said Kriesel. “A million people.” Community Bible Church has been around since 1945, when a midwestern couple new to Burlington held a tent meeting in what was then a field near Church Street. About 10 years ago, Kriesel connected with the Vermont Refugee Resettlement Program in an effort to reach out to new Americans. The relationship “just grew and grew and grew,” he said. The church now gives recent immigrants welcome packets, including invitations to CBC, and runs three shuttles to the church a week. This article was titled "Are You There, God? It’s Me, Vermont" in print.